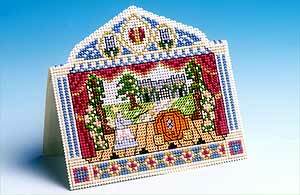 This design is pure fun, combining the image of a Victorian toy theatre with a favourite pantomime, Cinderella. The Fairy Godmother is shown in the act of turning the pumpkin into a coach, with the castle in the background. This card would make an unusual Christmas card for someone special, a delightful birthday card for a stage struck youngster, or a "Good luck in your new production" card for anyone involved in the entertainment business.